Product prices and availability are accurate as of 2019-04-19 19:49:19 UTC and are subject to change. Any price and availability information displayed on http://www.amazon.com/ at the time of purchase will apply to the purchase of this product. Create a new look in your home with this handsome, traditional style floor lamp. The design features one center light surrounded by three additional wattage bulbs. Decorative base is in an Italian bronze finish with gold highlights. A bell-shaped shade with trim sits on top. Overall: 64 1/2" high. Shade is 14" across the top, 18" across the bottom and 11" high. Takes one 150 watt bulb for top light and three 40 watt standard fan bulbs for the arms (bulbs not included). On-off switch for main light; separate 3-level switch for side lights (1 on, 2 on, 3 on). 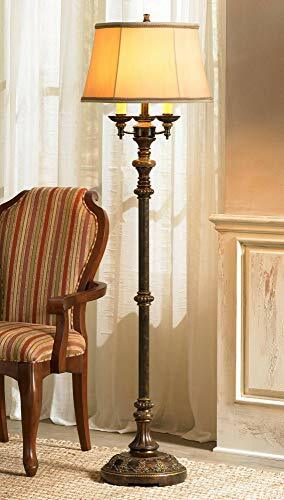 A traditional floor lamp design with candelabra arms under top shade, from the Barnes and Ivy brand. Italian bronze finish with gold finish highlights, bell shade with top and bottom trim.